Charlton have signed former Arsenal and Coventry striker Jay Bothroyd from Serie A club Perugia. Details have not been disclosed but it is thought the 23-year-old moved on a free transfer because of Perugia's financial problems. Bothroyd spent last season on loan at Blackburn where he scored just one goal in the Premiership. He becomes Charlton's 10th signing of the summer and replaces Francis Jeffers who has moved to Rangers on loan. 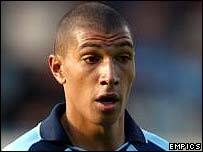 Bothroyd came through the ranks at Arsenal where he showed potential but he was allowed to join Coventry for £1m.